The fall and winter seasons bring colder, dryer weather, low humidity and because we spend more time indoors, exposure to environmental irritants like dust, mold and pet hair. These conditions can trigger nasal, sinus and throat distress. This is also the time of year that colds, flu and allergies become a challenge for the body’s immune system. Explore some of these effective natural herbal remedies and breathe easy this season. This powerful aromatherapy formula combines deeply penetrating ingredients: Oil of Eucalyptus, Tolu Balsam, Compound Tincture of Benzoin, Oil of Pine Needles, Rectified Oil of Turpentine and Rectified Beech Wood. Shaken together, Inspirol, Herbal Breathing‘s potent blend of oils creates fumes that are then inhaled through the nasal passages and through the mouth. These fumes permeate the throat, sinus, lungs and nasal passages to soothe irritated and swollen tissues, clear the breathing airway, reduce excess mucus and comfort a sore throat. A must for your home medicine chest, Respicol herbal syrup relieves that annoying tickle and soothes your scratchy throat, soothes hoarseness and raspy voice, and calms coughs. This gentle, pleasant tasting formula works with the entire body; calming irritated mucosal tissues, balancing digestive functions and strengthening the lymphatic system for better eliminations. Keep a bottle on hand for fast-acting relief and for a boost to your immune system during those seasonal challenges. Battling seasonal allergies, cold or flu can often mean dealing with minor muscle aches and pains as well. CamphorCare liniment provides deep warming relief for chest congestion, cold feet and minor back or neck pain. Massage CamphorCare after a warm bath or apply with a warm compress to stimulate blood flow, enhance circulation and relieve minor aches and pains. Have you had a great experience with any of these products? Let us know how they worked for you! This entry was posted in Healthy Breathing on October 29, 2015 by Dr. Bruce Baar. Spring has sprung and the trees, flowers and luscious greenery have started to blossom. Unfortunately for allergy sufferers, with it comes the frustration of seasonal bronchial and sinus distress. Molds, weeds, ragweed, and other pollen producing plants and trees bloom in the warming months of spring, creating havoc for the eyes, nose and lungs and disrupting your outdoor fun. Your nose serves as the first line of defense for your lungs. The primary function of nose hair is to filter foreign particles and airborne pollens which can cause a great amount of stress to the sinuses and nasal passages. From there, excess mucus develops to trap harmful particles and protect the lungs from foreign invaders. Respiratory relief can often be obtained when the nasal and/or bronchial passages are opened and cleared of excess mucus. Inspirol, Herbal Breathing™ is an excellent choice. It’s an easy-to-use, natural blend of essential oils formulated to help you breathe a little easier. How does Inspirol, Herbal Breathing Work? With penetrating ingredients such as: Oil of Eucalyptus, Tolu Balsam, Compound Tincture of Benzoin, Oil of Pine Needles, Rectified Oil of Turpentine and Rectified Beechwood, this powerful aromatherapy formula relieves a wide variety of symptoms that occur with seasonal allergy challenges. Shaken together, these ingredients create potent fumes that are to be inhaled through the nasal passages and then through the mouth. The fumes penetrate deeply to help soothe irritated and swollen tissues, open breathing passages, reduce excess mucus and relieve that throat “tickle”. 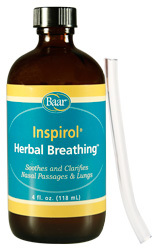 Inspirol®, or Herbal Breathing, is 4 fluid ounces of the above oil blend in an 8 ounce bottle. To use: Shake the bottle, remove the cap and place the tube into the air space above the liquid, then breathe in the fumes. Breathe deeply through each nostril and then in through the mouth, exhaling after each application. This entry was posted in Healthy Breathing on May 5, 2015 by Dr. Bruce Baar. Having a cold, post nasal drip or seasonal allergies often comes along with an annoying, scratchy tickle in the throat. Many conventional medicines contain harsh ingredients and have a list of side effects. Respicol® is a natural herbal syrup which integrates the traditional benefits of a unique blend of botanicals. It works within minutes to soothe irritated throat passages for fast relief without causing drowsiness. While other remedies may allow a dose or two per day, you can take Respicol as often as every hour until symptoms alleviate. Specially selected herbs are blended in a honey and syrup base to work with your body’s lymphatic, digestive and immune systems. Historical application of these herbs suggest they harmonize the systems of the body, enhancing the body’s ability to detoxify and cleanse. Horehound has been used for centuries as an expectorant. Traditionally, ancient Egyptians used horehound as an aid in clearing mucus from the respiratory system. It soothes those irritated mucous tissues especially in the throat. Wild Cherry Bark alleviates distress especially of the nose and throat by relieving swelling of mucous membranes. It is also effective for boosting sluggish digestion. Rhubarb is a mild stimulant to liver and gall bladder. This will help clarify the system and remove toxins that may be causing irritation to the respiratory system. Wild Ginger tones and purifies the digestive tract and the lymphatics associated with the intestinal tract. This herb enhances circulation and supports the body’s immune response which may help relieve the scratchy tickle in the throat which causes the urge to cough. Many of the herbs in Respicol aid the function of the body’s lymphatic system, assisting it in cleansing and detoxifying thereby supporting proper eliminations. Once these systems begin to work more effectively, the body’s circulation improves helping to clear the throat and respiratory systems… stopping that annoying tickle from coming back. How has Respicol Helped Others? “I wanted you to know that I think Respicol is a great product. Recently, I had a cold with coughing that had lasted a while…I bought a bottle, followed the directions, and immediately my coughing eased. My throat was so much more comfortable. I now have a bottle in reserve, just in case. Thanks for making Respicol available!” – T.W. This entry was posted in Healthy Breathing, Immune System, Natural Products on May 27, 2014 by Dr. Bruce Baar.